Daisy is a 12 year old Quarter Horse mare that did not present with any lameness or riding complaints. Her owner only reported a head tick that was thought to be due to allergies by a previous veterinarian. She was evaluated for the purpose of this case report and was treated for subclinical manifestations of cervical pain, lumbar pain and sacroiliac joint pain. During the course of four treatments spanning a 7 week period, her muscle imbalances improved and her head tick completely resolved. Her owner plans to use acupuncture and laser on an as needed for her symptoms. Daisy is a 12 year old Quarter Horse mare. Her owner uses her for mostly pleasure riding and trails but does arena work when the weather is challenging. She uses a typical western treed saddle with a bridle and bit when riding. Her owner has a horse boarding facility for lame horses and is very diligent about diet, foot care and encourages foraging and roaming type facilities. Daisy takes hydroxyzine 100 mg once to twice daily as needed for her head tick that she seems to get more in the summer time. Her previous vets have said her intermittent head tick was due to allergies. She is otherwise healthy per her owner and does not have any trouble with riding, other than her head tick. She routinely has her teeth floated every two years. She eats mostly forage and hay with little to no grain. Her physical exam was mostly unremarkable. Her eyes, ears, nose, throat and oral exam were unremarkable. She has no palpable sinus pain and no nasal discharge. Her heart, lung and gut sounds were all within normal limits. She walked and trotted with ease and her overall musculature was symmetric. Daisy only showed abnormalities in her myofascial exam. When I started my physical exam, she would shake her head once or twice, especially during neck palpation, and Joslin told me that was her “tick.” She was tender to palpation at BL 10 bilaterally and had ropey bands on each side of the cervical spine. She had moderate restriction of fascia in her left caudal neck and in her lumbar spine from T16 to the sacrum. Her right caudal neck has milder myofascial restriction, but still not completely normal. She buckled under very slight pressure of sacroiliac joint squeeze. She also was very stiff to turn head to the left with vertebra C1, C2 and C3. All other joints and range of motion were unremarkable. She did not react with palpation of the temporomandibular joint or head muscles. Her distal limb and hoof tests were all normal. I was concerned the head tick could have other possibilities than allergies and my main rule outs were rhinitis as it is more severe seasonally, optic nerve sensitivity, dental pain, ear pain, neck pain, trigeminal pain, or temporomandibular joint (TMJ), however, physical exam ruled out TMJ and ear pain. Her history suggests that it should not be dental pain with routine floats. I was able to induce the head tick when I was gently touching painful areas on her neck, which also indicates a behavioral type response. It may be worse in the summer as she is ridden more in this season. My physical exam findings showed areas of concern in the cranial cervical spine, myofascial restriction in the caudal cervical and cranial shoulder region, and lumbar to sacroiliac joint pain. As these symptoms appear to be mostly subclinical to the owner as well as mostly chronic in nature, my main differentials include degenerative arthritic changes, iatrogenic and possibly poor saddle or bit fitting as well as an old traumatic event. Other rule outs would include a congenital malformation (likely in the cranial cervical spine), a neoplastic or space occupying lesion, or infectious (such as myelitis or guttural pouch infection). Autoimmune conditions and metabolic or endocrine processes may be possible but do not fit well to Daisy’s presentation. With Daisy’s history and use, my putative diagnosis was mostly muscle imbalances, SI arthritis, and cervical pain. Her seasonal head tick symptoms are persistent with rhinitis but behavioral response to other pain, TMJ pain, and trigeminal pain are still considered. Based on history, physical exam, and putative diagnosis we focused treatment on cranial cervical neck pain, lumbar pain and degenerative joint disease in the sacroiliac (SI) joints. The goal is to relieve muscle imbalances and pain while also improving the riding experience for both Daisy and Joslin. I used the following techniques to cover the central, peripheral, autonomic (CPA) and myofascial approach (es). My “ideal” acupuncture points were as follows3 (though not all points were able to be performed at every session): GV 20, GV 14 (mostly for calming effects, as well as neck pain), Bai Hui (for calming effects, and SI pain, central point), GB 20, BL 10, TH 16, LI 16, LI 17 and LI 18 (for neck pain and potential anxiety of neck pain and her head tick), GB 21, SI 11, SI 12 (due to myofascial restriction in this area as well as central, peripheral and some autonomic), cervical trigger points (for myofascial), BL 22-28 (for thoracolumbar pain, muscle restrictions, central and peripheral stimulation), GB 29 (for sacral spinal nerve stimulation), TH 17 and ST 7 (for possible causes of “head tick,” TMJ, dental, or ear pain, CPA effects). I also tried to include ST 36 in most treatments for its CPA effects. 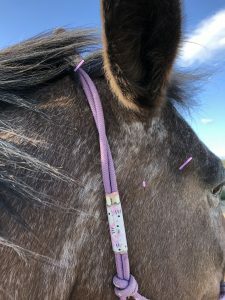 Between acupuncture appointments, her owner changed to a lighter and better fitted saddle and performed some neck stretches and range of motion as she was able. When she rides in the arena, she makes sure to balance her routine equally with left turns and right turns. 5/14/18: For the first treatment, we started with Seirin 0.25 mm x 40 mm needles. Points treated were GV 14 and Bai Hui. Bilateral points treated were BL 10, BL 22, BL 23, BL 24, BL 25, BL 27, BL 26, and GB 21. On the left side we treated BL 13, BL 15, BL 16, BL 17, SI 11, and SI 12. A few local trigger points were treated on both sides of the neck. GB 29 was attempted but her skin/fascia was so restricted, the needles would not advance. I attempted ST36 on the left, but she immediately kicked and the needle did not go in. The needles were left in place for about 20 minutes. Daisy became very sleepy and her head hung low and she swayed slightly. Her owner was very impressed at the level of relaxation. 5/31/18: At her second treatment she did not have any new myofascial changes and most of the previous ones were improved. When prompted Joslin reported that she had not given any hydroxyzine for her head tick for the last week because she did not seem to shake her head. She shook her head once when I was palpating BL 10 on the left. We used a combination of Seirin 0.3 mm x 40 mm needles (as the skin in her rump region is very thick and difficult for the 0.25 needles to penetrate). Points treated were GV 20, GV 14, Bai Hui; bilateral ST 7, BL 23, BL 24, BL 25, BL 26, BL 27, ST 7, TH 17, GB 29. She declined ST 36 again, but I was able to get bilateral LI 11 for autonomic stimulation. The needles were left in place approximately 20 minutes. Laser was used at this appointment: A K-Laser Platinum machine was used with a custom treatment protocol and not preset protocols. We treated her left cervical spine with 6 watts at 810 nm for 3 minutes then 6 watts at 980 nm for 2 minutes. This was repeated on the contralateral side at the same dose. The third and fourth treatments were identical to the second treatment (points treated and laser therapy). Her lumbar myofascial restriction was about 80% improved at the third visit and about 95% improved at the fourth visit, even with owner still riding and training. Her neck mobility was markedly improved as well. And her owner had still not seen her head tick anymore, nor was I able to induce it with neck palpation as I had at the initial visit. 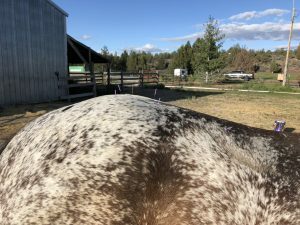 Daisy was an excellent case of how acupuncture is used to treat pain that is not always evident to owners or that can manifest in an abnormal way, such as her head tick. She did not present with any lameness or owner complaints about riding, but we were able to improve a very subtle behavior that her owner was unaware was a clinical sign. Once demonstrated to her owner, Daisy’s subtle signs and head tick helped her owner to become a more conscientious and skilled rider. After treatment, Joslin realized that her head tick was now completely absent and she has not given hydroxyzine since starting these acupuncture treatments. She now makes appointments based on the return of that particular sign. In future treatments I hope to incorporate electroacupuncture to see if it will bring longer lasting relief1,3. 1) Devereux, S. Electroacupuncture as an additional treatment for headshaking in six horses. (2017). Equine Veterinary Education. 0 (0). 2) Dyson, S. Carson, S. Fisher, M. Saddle fitting, recognizing an ill-fitting saddle and the consequences of an ill-fitting saddle to horse and rider. (2015). Equine Veterinary Education. 27 (10). Daisy was an excellent example that working horses should routinely be evaluated for pain, myofascial restrictions and muscle imbalances. 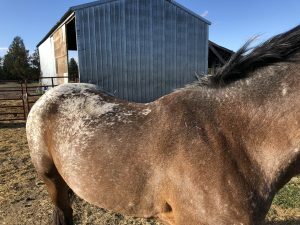 Most well-behaved horses generally do not reveal to owners that they are painful but, instead, may show individual behavioral changes, such as Daisy’s head tick. This case really stressed to me the importance of a gentle and thorough myofascial exam for every patient.